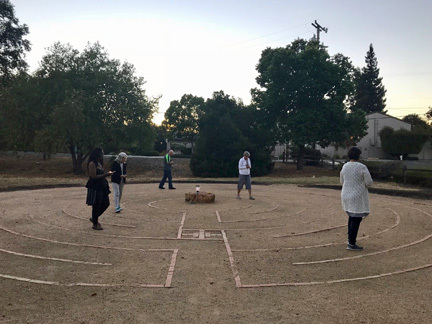 The labyrinth at Church of the Resurrection is located on the Kahrs Avenue side of the church. It was completed in 2015 and is open to all who wish to use it. We hope you will find the following information helpful to your understanding of this ancient spiritual tool, and to your walk. Perhaps this question is best answered by knowing what a labyrinth is not. A labyrinth is not a maze. A maze is a complex puzzle with multiple entries and exits, and many dead ends. 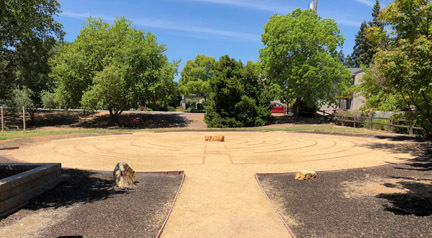 Although it may be found in a variety of styles and patterns, a labyrinth, on the other hand, is one well-defined path leading to the center and back out again. There are no tricks, no intersections, no dead ends, and no decisions to be made. Labyrinths are an ancient spiritual tool for meditation and prayer, and may be found in almost every spiritual tradition. The oldest surviving labyrinth dates to approximately 2500 – 2000 B.C. The labyrinth entered into Christian spirituality during the Middle Ages and is believed to have provided a “pilgrimage” experience for those unable to make the dangerous and expensive trip to Jerusalem. Perhaps the best-known church labyrinth may be found inlaid into the floor at Chartres Cathedral in France, which dates around 1201. A labyrinth may be considered a metaphor for the spiritual journey. Simply stated, the design forms a winding but purposeful pathway to the sacred. Walking this unicursal path leads us into a deeper connection with God, others, and our inner selves, and then back out again into the world. Importantly, although the route to the center is neither obvious nor direct, we must always trust the path so that we may fully experience the journey. There are probably as many ways to walk a labyrinth as there are people, and as many reasons for walking, as well. A walk may be for the purpose of gaining clarity or insight, seeking healing, quieting the mind and soul, praying and meditating, answering a question, becoming more in touch with our inner being, or simply drawing closer to God. Importantly, there is no right or wrong way to walk. The idea is simply to quiet one’s mind and focus on the walk itself, drawing from it whatever the experience has to offer. Interestingly, because we come to the experience differently every time, walkers usually find each walk to be unique. (Releasing) – the walk into the labyrinth toward the center is the first part of the path. It is a time to release anything that stands between you and the Divine, to quiet your mind and open your heart, to let go of thoughts and distractions that clutter your being, and to open yourself and become present to the experience and to the Spirit. (Receiving) – our time at the center is one of prayer and meditation, receiving insight, clarity and whatever is there for us on the walk. Staying as long as you like, you may sit, stand, or even lie down. When you feel ready, simply follow the same path back out of the labyrinth. (Returning) – We take the same path out as we took in. This part of the journey is one of union with the Holy, of integration, and empowerment as we turn our insight into action, joining with God to bring into our life what we have received in the center. There is no right or wrong way to walk.Experience helps each of us find our own way and our own style. Walk with an open mind and an open heart and receive whatever is there for you. Release your expectations, focus on your breath and find your own individual pace. There is one way in and one way out.Those going in will meet those coming out. You may pass others on the path or allow them to step around you. Simply do whatever comes naturally.